I wrote this time a year ago that we had broken ground at Duke for the new Comprehensive Cancer Center building. 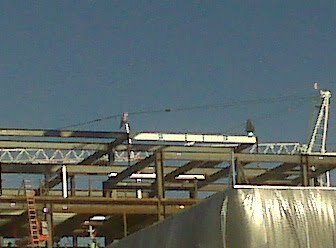 Well, I attended the topping off ceremony last week where the last beam is hoisted into place, along with an evergreen tree to keep "evil spirits" away. We all got to sign the beam before it was lifted away, and I also signed my parents' names and my brother's. They would be so proud to see how far we've come. It was thrilling, to say the least, to watch that beam be put into place. I've attached a picture here. Look closely, and you can see the white beam and the tree! The building will be finished in 2012!